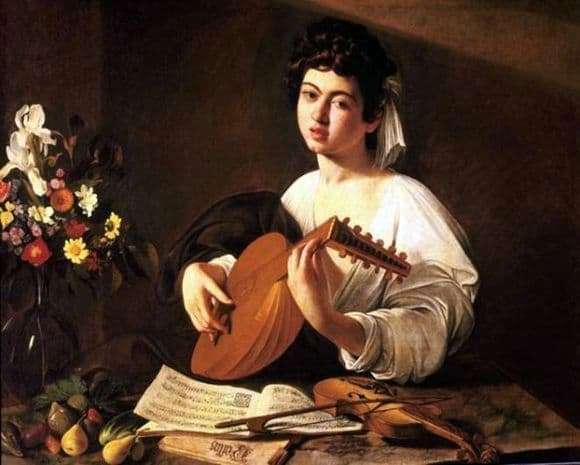 Caravaggio’s painting “Lute” or “A Young Man with a Lute” is a vivid exhibit of the Hermitage. But the picture is also presented in several museums of the world, for example, in the Metropolitan Museum of Art, in New York. And experts still do not agree on which of the works is the original, and which are only copies. Caravaggio created his painting in 1595 by order of Cardinal del Monte. The size of the work is 100 by 126 centimeters. And she made oil. In the picture the artist depicted a boy who plays a strange instrument. In his hands he holds a lute, this instrument was popular in the Middle Ages. The boy was not accidentally chosen for posing. Everyone believes he was a friend of Caravaggio. In addition, the artist depicted him several times in his paintings. The young man has dark thick hair. He is dressed in an ordinary white shirt. On his right hand is a black cloak casually. His mouth is slightly open, but it is clear that he enjoys playing the instrument. In the left part of the picture there are flowers, this is a bright bouquet where we see yellow daisies, small red roses and ordinary wild flowers. And in front of the guy with the lute is a table. On it are musical notebooks, where you can even see the lines. Also on the table is a violin and bow. Perhaps the boy in the picture is a talented musician who plays several instruments. Near this “musical disorder” on the table are ripe fruit. The picture itself really liked Caravaggio. He liked everything: his friend, composition, plot, colors. By the way, the artist approached the choice of shades with all the responsibility. In this picture is dominated by warm colors. In the left part of the picture, the author clearly wanted to add a few bright spots. So, he painted flowers and fruits. Without them, the picture would have been made in exclusively milky shades. For its existence, the picture traveled a lot, in Russia it appeared in the 19th century.